Every now and then I get a really good idea when I'm in the hot tub late at night. Sometimes the ideas are really quite harebrained, but I do a lot of thinking in there. Last night I got the idea to do a Novel Idea quilt post so I hope you think this is a good idea too! Each quilt is labeled with the title of the quilt and the title and author of the book. I've included all the Novel Idea quilts I've made over the past 8 years and a couple of extras. Imagine (above) was the first. It is completely hand stitched using cloth weaving and embroidery techniques learned from Jude Hill. The Novel Idea program with the Deschutes Public Library is a community read program. The book is usually announced in December and we have about 4 months to read the book (less if you are going to be creating art, of course) and then there is a month of group activities offered by the library which culminates in the author visiting town to do a lecture. As a life-long reader and lover of books, this has always been one of my favorite things about our library. I was thrilled when Marilyn Forestell (also a book lover and owner of QuiltWorks) suggested starting the Novel Idea Quilt club which gets together just for the purpose of creating quilts and textile art for this program. Often the author has been able to visit the quilt gallery to see the exhibit and they've always been so thrilled to see it. That first year Teddy Wayne was able to see the quilts and I was there. It was so great to be able to meet the author and discuss how I was inspired to create this quilt. Tea is No Minor Beverage is not actually a Novel Idea quilt, but it's here for a reason. During that first year everyone was so fired up about making book quilts we decided to do a second project that year and we chose The Elegance of the Hedgehog. I didn't realize until doing this blog post that I've done a tea cup before! After this one extra book we went to just doing the Novel Idea quilt each year. It was never a cohesive group to begin with and many of us are now in other small groups which make book quilts. Mine is The Undercover Quilters which I've mentioned many times before. The third year we read Rules of Civility which was a favorite with many. One of the things I love about book clubs of any sort is that I am introduced to books and authors I don't know about. I became a fan of Towles with this book. His more recent novel, A Gentleman in Moscow, is one of my favorite books ever. You may have noticed that this piece is made with silks. Also, many of these are hand stitched. One thing about the Novel Idea quilts is that there are no size restrictions. When creating for most quilt shows, your work must meet a minimum size. When I'm doing hand stitched art pieces I prefer to work small, so I love that I can work with any size that works for me. There also also many hand dyed fabrics in these pieces. I tend to use my most favorite pieces of fabric for these small gems. Of all the books we've done for the Novel Idea Quilts, I think The Snow Child was the most loved by the quilters. It's such a visual book with themes that appealed to many. I had so much fun with this piece. I used hand dyes and vintage linens and it's all hand stitched. I did get to meet the author, but it was at the book signing rather than the gallery. She did see the quilts and was very touched by the whole exhibit. If you haven't read The Dog Stars, it's a novel about a post-apocalyptic future. Many people I know in town as well as many quilters were put off by the theme, but I actually really loved this book. There were some lovely moments including a passage which included a poem by Kim Stafford, one of Oregon's past Poet Laureates. 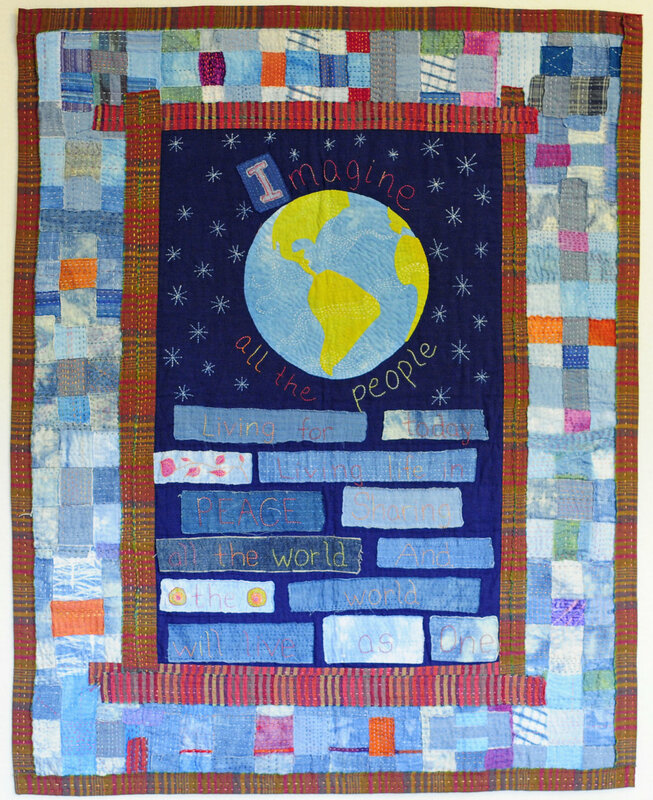 This quilt, which is quite small, was inspired by that poem within the book. I was able to meet the author at the book signing and to tell him about my quilt. He saw the exhibit and was so inspired he asked if any of the pieces were for sale. In the end he bought several of them including mine. What an honor! A Tale for the Time Being was such an interesting book. The author talk was also fascinating. Like I said in the previous post I am always on the lookout for nature themes, wildlife and especially birds when I read a book for a quilt. This one did not disappoint with a Jungle Crow that keeps returning to visit one of the main characters. This one is machine pieced, hand appliqued, and hand embroidered using many hand dyed fabrics and some vintage linens. In 2015 my sister, glass artist Cheryl Chapman, moved to town. She also loves books and is a quilter so I thought I'd better get her involved in the Novel Idea quilts. We both made quilts for the exhibit, mine is above. I was inspired by the cover of the book and also a passage about the rainbow gum trees. In addition to that Marilyn had an idea for folks to make masks as part of the exhibit. It was a theme that related to the book and many people did so. Cheryl came up with the idea of making glass masks. We had so much fun getting together to do this. We created the glass forms in her workshop and she fired them. Then we had a day in my studio creating the fabric additions for the top of the masks. 2016 Fused Glass Masks (Euphoria by Lily King) Cheryl Chapman on the left, me on the right. Last year the book was Homegoing which had a multitude of characters, time frames and locations. In end I decided to put this quilt in the exhibit even though it wasn't made just for the book. I had actually finished it a couple of months before with no other inspiration than seeing an old H quilt and thinking it would be cool to try it in an improv manner. Plus, my maiden name starts with H. As it happens, one of the main characters in the book was called, simply, H. How coincidental is that? You can read yesterday's post to find out about Ranjana's Chai (below). If you haven't made a book quilt yet I highly suggest it as a jumping off point. My rule with them has always been that my quilts are inspired by the book. They are not necessarily illustrations of the book. You can take a feeling, phrase, sentence, word, color scheme, character, animal or object for your inspiration. It is really fun though and maybe you'll even meet the author some day! I have done 19 book quilts so far (wow!) and am making plans for my 20th for the Undercover Quilters. This year our book choice is Martin Marten by Brian Doyle. I can't wait!